Bringing green design, majestic nature and urban pioneering together is the theme of this year's Association of Landscape Designers' annual conference July 13-19 in Portland, OR. 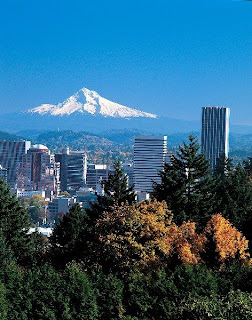 Voted the most sustainable city in the US in 2008, Portland's city planners have been thinking green since the 1970's. Open to the public, the conference features talks, tours and a trade show. The talks range from edible gardens and what makes an award winning design to green roof designs and the sustainable design movement. Tours include Portland landmarks such as the famed Classical Chinese Garden to fabulous private retreats. The conference closes with the annual awards banquet and 2oth anniversary celebration at Portland's landmark Governor Hotel. So if you are in the area and want to tour great gardens and learn from professional landscape designers, Portland in July is the place to be. For more information, click here. It's nice to be in an area where landscape and green living is continually improving. It has not advanced as fast as some have hoped, but it is getting better and better all the time. Especially more focus on soil care being implemented. It also involved greatly enlarging and improving existing villages.